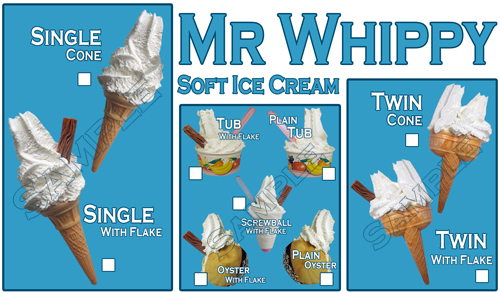 Soft ice cream stickers for your ice cream van serving window or shop displays, We are now supplying to the trade and general public high quality laminated soft ice cream stickers. 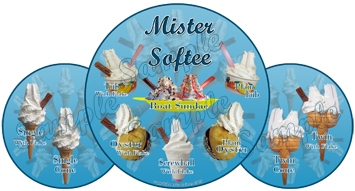 No need to use individual stickers any longer with our tailor made soft ice cream stickers made to make your van or shop window display stand out from the crowd. Please do not attempt to copy any of our designs as all designs are protected under copyright law and anyone found to be copying for personal use and/or re-selling our designs will be prosecuted. please feel free to view your shopping cart either during or when you have finished your shopping by clicking the link below. 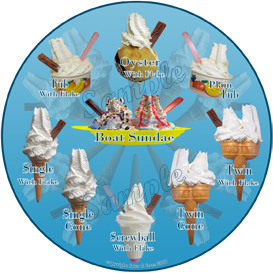 Info:8 x round decals each approx 130mm in diameter (screwball / screwball flake / oyster / oyster flake / tub / tub flake / boat sundae / double nougat wafer), 1 x cone with flake approx 240mm height ,1 x plain cone approx 240mm height ,1 x plain twin approx 240mm height ,1 x twin with flake approx 240mm height ,1 x freshly made ice cream sticker 35mm height by 535mm width ,1 x ice cold drinks cut out wording approx 50mm height by 490mm width ,4 x wording each 23mm height by 110mm width ( 1 single cone / 1 single flake / 1 twin cone / 1 twin flake ) ,4 x drinks decals each 110mm in diameter ( coca cola / fanta / 7up / diet coke ) ,Specially made to stick on the outside of your windows and laminated so no fading, Made from excellent quality vinyl and excellent quality artwork(so not out of focus or blurred). 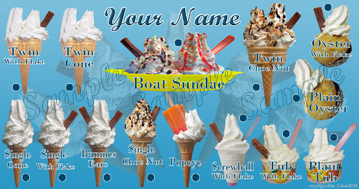 Info: Soft ice cream sticker, size approx 650x350,Specially made to stick on the outside of your windows and laminated so no fading, Made from excellent quality vinyl and excellent quality artwork(so not out of focus or blurred). 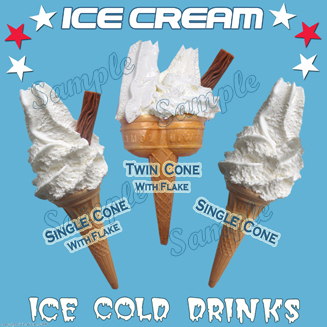 Info: Soft ice cream sticker, size approx 670mm width x 563mm height ,Specially made to stick on the outside of your windows and laminated so no fading, Made from excellent quality vinyl and excellent quality artwork(so not out of focus or blurred). 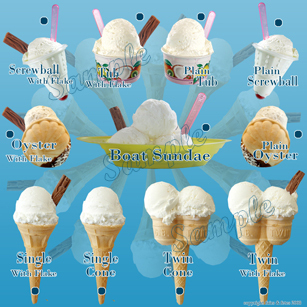 Info: Soft ice cream sticker, size approx 350x650,Specially made to stick on the outside of your windows and laminated so no fading, Made from excellent quality vinyl and excellent quality artwork(so not out of focus or blurred). 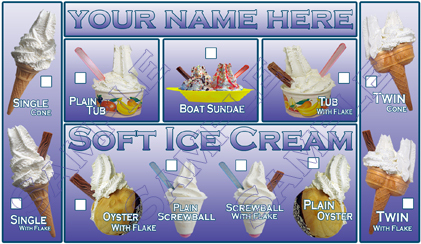 Info: Soft ice cream sticker, size approx 650mm width x 450mm height , these are cut outs so you can stick them around window seperatley if needed. Specially made to stick on the outside of your windows and laminated so no fading, Made from excellent quality vinyl and excellent quality artwork(so not out of focus or blurred). 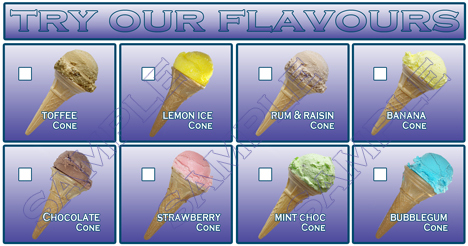 email with colour if not listed. 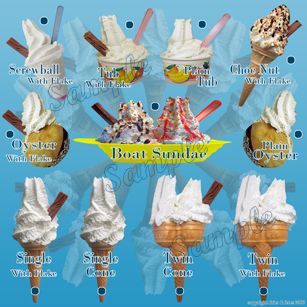 Info: Soft ice cream sticker, size approx 650mm width x 370mm height , these are cut outs so you can stick them around window seperatley if needed. Specially made to stick on the outside of your windows and laminated so no fading, Made from excellent quality vinyl and excellent quality artwork(so not out of focus or blurred). 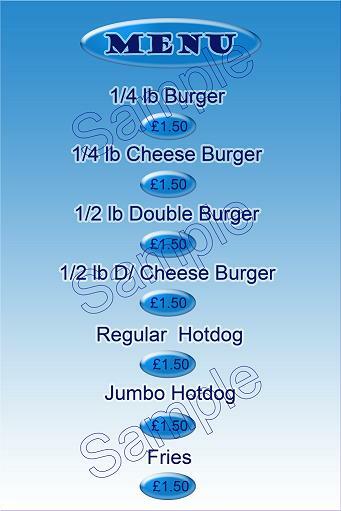 + choice of your own wording at top. 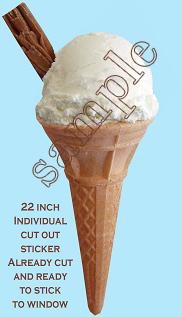 Info: Soft ice cream sticker, size approx 610mm width x 450mm height , these are cut outs so you can stick them around window seperatley if needed each square measures approx 150mm width by 130mm height. Specially made to stick on the outside of your windows and laminated so no fading, Made from excellent quality vinyl and excellent quality artwork(so not out of focus or blurred). 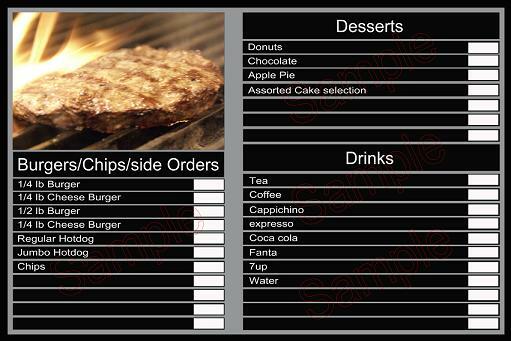 + choice of your own wording at top. 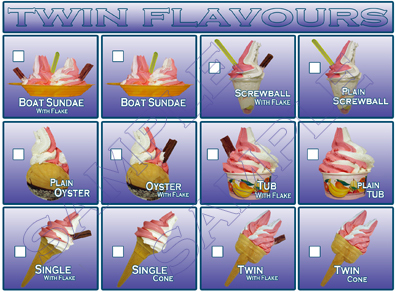 Info: Flavoured hard ice cream sticker, size approx 610mm width x 320mm height , these are cut outs so you can stick them around window seperatley if needed. 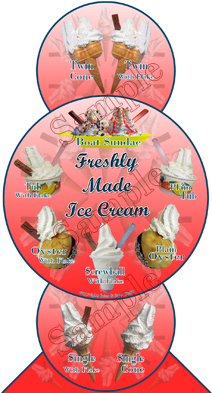 each square measures approx 150mm width by 130mm height, Specially made to stick on the outside of your windows and laminated so no fading, Made from excellent quality vinyl and excellent quality artwork(so not out of focus or blurred). 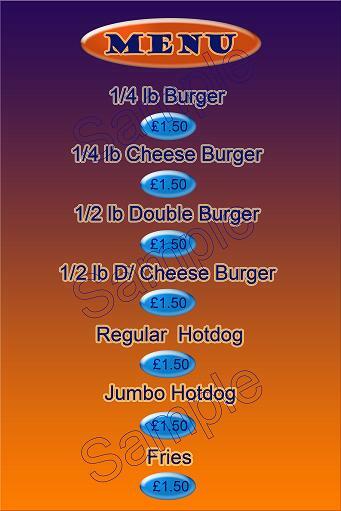 + choice of your own wording at top. 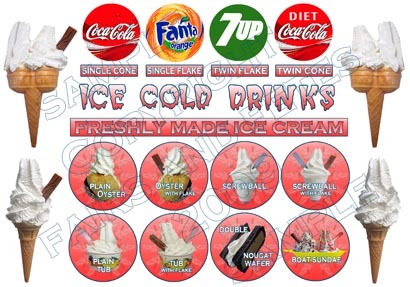 Info: Soft ice cream sticker, size approx 400x400,Specially made to stick on the outside of your windows and laminated so no fading, Made from excellent quality vinyl and excellent quality artwork(so not out of focus or blurred). 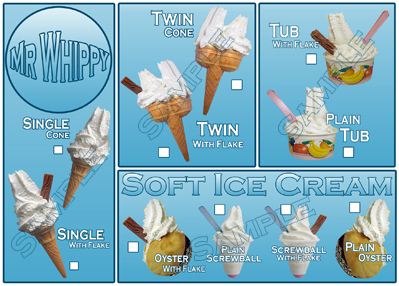 Info: Soft ice cream stickers, size approx 400mm x 400mm height, Specially made to stick on the outside of your windows and laminated so no fading, Made from excellent quality vinyl and excellent quality artwork(so not out of focus or blurred). 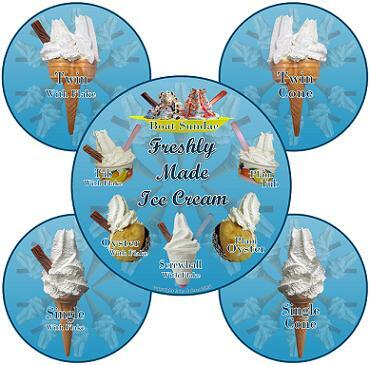 Info: Hard ice cream sticker, size approx 400mm x 400mm height, Specially made to stick on the outside of your windows and laminated so no fading, Made from excellent quality vinyl and excellent quality artwork(so not out of focus or blurred). 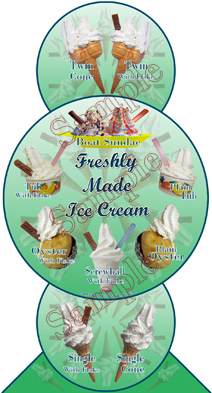 Info: Soft ice cream show sticker, size approx 600mm width x 600mm height, Specially made to stick on the outside of your windows and laminated so no fading, Made from excellent quality vinyl and excellent quality artwork(so not out of focus or blurred). 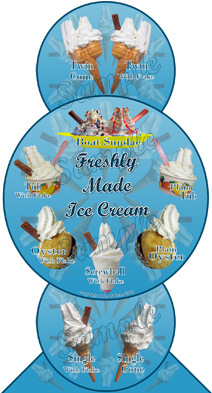 ideal for those shows/fetes where you dont want to sell loads of different items and want to concentrate on a few to serve quicker..
Info: Twin Flavour Soft ice cream sticker, size approx 610mm width x 450mm height , these are cut outs so you can stick them around window seperatley if needed each square measures approx 150mm width by 130mm height. Specially made to stick on the outside of your windows and laminated so no fading, Made from excellent quality vinyl and excellent quality artwork(so not out of focus or blurred). 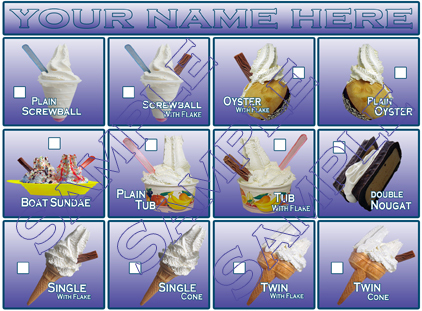 + choice of your own wording at top. 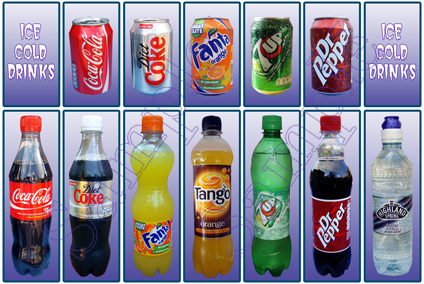 Info: Individual Drinks stickers, size as whole approx 590mm width x 400mm height (whole sticker), these are cut outs so you can stick them around window seperatley if needed. Specially made to stick on the outside of your windows and laminated so no fading, Made from excellent quality vinyl and excellent quality artwork(so not out of focus or blurred). 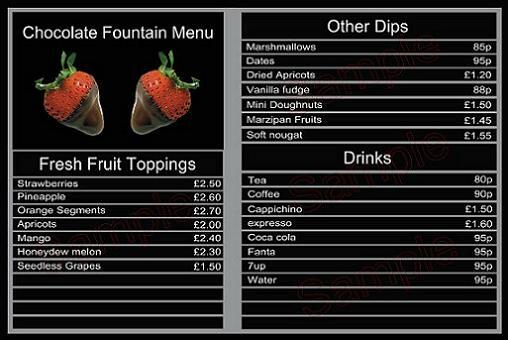 + choice of your own wording at top. 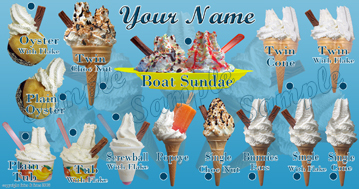 Info: Knickerbocker Glory Freshly made selection measuring approx 530mm width by 190mm height (including name strip across top). 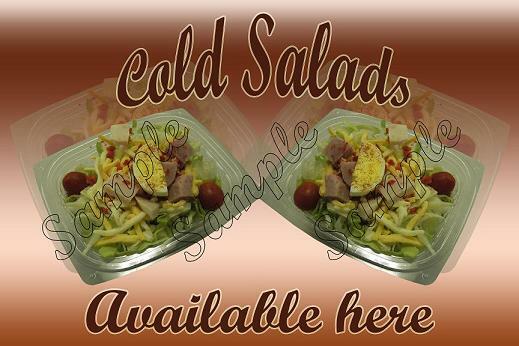 Specially made to stick onto flat surfaces i.e flat clean walls / windows / flat work surfaces(can be made to stick from inside, please ask for prices before purchasing) and laminated so no fading, Made from excellent quality vinyl and excellent quality artwork(so not out of focus or blurred). 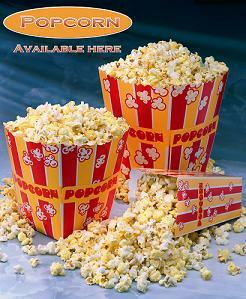 Info: Popcorn vinyl display sign measuring approx 42cm height by 34cm width. 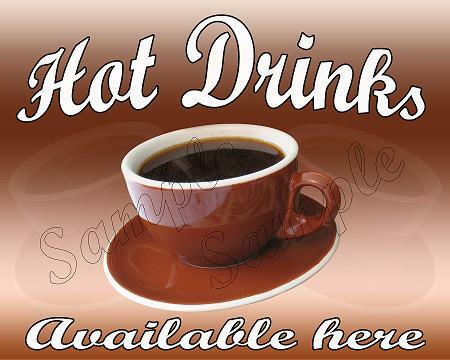 Specially made to stick onto flat surfaces i.e flat clean walls / windows / flat work surfaces(can be made to stick from inside, please ask for prices before purchasing) and laminated so no fading, Made from excellent quality vinyl and excellent quality artwork(so not out of focus or blurred).